Are you looking for a safe place for your child to play? Play yards (also know as playpens) are a great way to provide a contained, comfortable and safe play area for your baby or toddler. Play yards allow you to fence off an area of your house or yard to make sure that your child can’t wander off or get into anything they shouldn’t. A play yard will do a good job of keeping things away from your kids – like pets or older, rougher kids. The result is your child has the freedom to play without you needing to make sure they aren’t coming into contact they shouldn’t. There’s a lot of options with play yards so we’ve covered what you need to look for and the best play yards of 2018. To make comparing the available play yards easier, we’ve put the key details into an easy to use table. You can sort the table by clicking on any of the attribute headings. When searching for your perfect play yard, you will likely see the terms ‘play yard’ and ‘playpen’ used interchangeably. That is because they are basically the same thing. ‘Play pen’ is the traditional term and to some people the term will still envision a metal-framed play area. However, playpen baby options have evolved from not only the traditional barrier but into their own fully enclosed pop up units. ‘Play yards’ are basically the same thing, however you may notice that those listed as play yards include more features such as bassinets and changing stations. This is not a rule, however, and the majority of the time the terms used is based solely on preference. If you are a busy parent like me then it is likely that your child will be spending a fair amount of time in there to play. Therefore, it’s important to consider what features will suit both of you the best so that you don’t waste your money. It is great to have the option to use your play yard outside, however many play yards are not designed for this. Fabric materials will not fair well being exposed to rain and wind, and therefore if you are planning to use your playpen outside, the materials that it has been constructed with will be important. Generally, plastic playpens are best for outdoor use, but you can also find durable waterproof designs that can be just as good. For indoor use, I think the main priority is to ensure that the playpen is not sliding around the floor. This means either a sturdy leg for carpet or suction cups for hardwood floors/tiles. As above, the material of the play yard matters in regards to where you will use it, but also for what function you want it to serve. For travel I have a preference for material play yards as they are generally lightweight and easy set up, although there are also some great plastic play yard designs for travel too. A metal play yard is usually incredibly heavy, but equally as strong and if this is a priority for you then a metal play pen may be suitable. Some play yards really do deserve the word ‘play’ in their name, as they really are designed for that, coming fully equipped with detachable toys, changing tables, basinets and play gyms. This is great not just because you get the accessories to go with your play yard, but because it saves you from buying them individually. You can also find play yards that are designed as houses with features to really that kids will find really cool. Other play yards will have only the area for play. This is fine for older babies, but for younger ones I would recommend the accessories, if only to save you buying them individually. This is probably number one for me. I am a travelling Mom, after all. I need a baby portable play yard that is not only lightweight but also easy to carry and not bulky. I don’t need tricky shapes to navigate on a plane or shovel into a taxi/bus. This means no awkward shapes; a relatively lightweight design and a preference for play yards that fold completely. It is also essential to have a bag – most do, some don’t, and others just include a handle but a bag is essential for protection when travelling. Toddlers and babies have different needs, and obviously the same goes when looking for a play yard. Play yards for infants will differ from play yards for toddlers. Toddlers need to be restricted and enclosed as we know they would jump out at any given moment. Babies require an enclosed and comfortable area to sleep in, and I think for babies that is where it is important to try and get a bassinet and change table included. 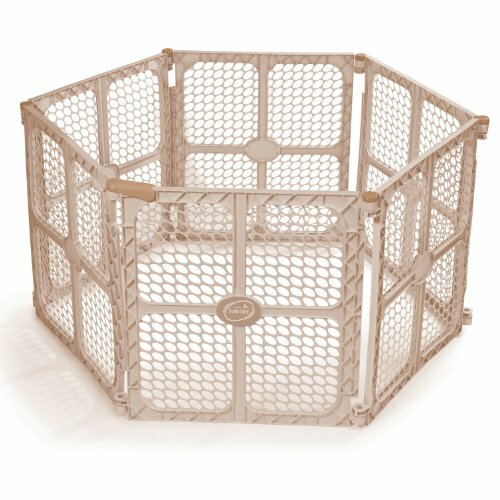 These things can really make the difference for convenience in playpens for baby. Also, not all play yards are suitable for all ages. Keep this in mind, because regardless of whether you looking for a baby, toddler or a play yard suitable for both your search will be narrower. Establish who it is you are looking for and when in life they will need it. The Joovy Room2 portable play yard is the first play yard on my list of playpens for baby, and it’s not by chance that I have put it up the top. I loved this play yard, and it has scored well in the best play yards reviews, which have agreed that it’s just perfect for travel. This play yard is significantly larger than other travel play yards at 10 squares and is extremely well built. Just by looking at it you can see that it is strong and stable, but practically it’s also safe. Although it is portable and folds nicely, it is also intentionally not feather light. This means the playpen offers great support. I loved the 600D material; you could really tell how solid the play yard is. Something that reinforced the strength is the fact that the play yard has no weight limit – it is useable until your child grows out of it. Found within is a 100% cotton play yard mattress sheet that I wanted to steal for my bed. It is really comfortable, plus it is removable and machine washable. Because of this it really is and convenient for naps. The design of the Joovy play yard is simple and modern, and there is a large window for keeping watch. There are wheels on the play yard that made moving it really simple, it is easy to fold up and includes a strong carry bag, essential for travel. Two toddlers would fit comfortably within it, and I would definitely recommend this one if you’re looking for more than one child. The baby play yards not only great as an affordable travel option, but could easily work as your everyday play yard to really get your moneys worth. Click here to read more about the Joovy Room2 Portable Playard. If you are looking for a spacious and colourful play yard for your children, either to keep in the home, or to transport around when you travel, this is a great choice. Of course, Graco are a big named brand, so you get instant peace of mind on reliability, and this play yard is certainly a bright choice which will stimulate your child’s imagination for play. This particular play yard is easy to fold down and back up again, and can be used anywhere, thanks to its compact size. You will find mesh on all four sides for ventilation, as well as allowing parents to keep an eye on their child at all times. Easy to clean, safe, and easy to store or transport, with an included carry bag too. The play yard can be cleaned with mild soap and warm water, which means it will stand the test of time, and is perfect for children who are under 35” in height and who can’t climb out of the play yard with its high sides. The large size of the play yard means that there is plenty of room for your children to play and keep themselves occupied whilst you do whatever you need to do, and for travel trips this is ideal, whilst also offering a comfortable place to sleep. The Cosco Funsport play yard is the next and it’s a great portable play yard for babies, and not only because it is the most affordable travel option! This travel play yard is made of a combination of metal, plastic and polyester, it is actually a relatively lightweight play yard for being so solid. This is a perfect portable play yard for travel due to it being so lightweight at around 19 lbs. Folding the play yard was simple due to it’s lightweight, and it was just as easy to set up. What makes this play yard even more convenient for travel is the included travel bag, which also has wheels for easy transport. The padded floor of the Cosco play yard is welcomed – however, I found this to be too hard and you will definitely need a blanket or pillow for naps. Each side of the Cosco play yard is mesh, so there is good visibility for both parents and kids so you can watch your play yard baby. I also loved that this infant play yards maximum age limit doesn’t exist! You can use this baby portable play yard until your child grows too big for it. This is something that I look for in the best portable play yard. 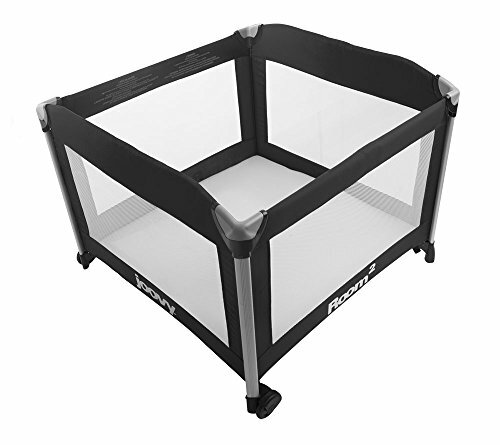 The portable playpen is usable until your child can climb out! Needless to say, it will last a while. The portable baby play yard also comes in a range of patterns, and some were really fun and pretty. Kids could sleep very comfortably in this play yard. 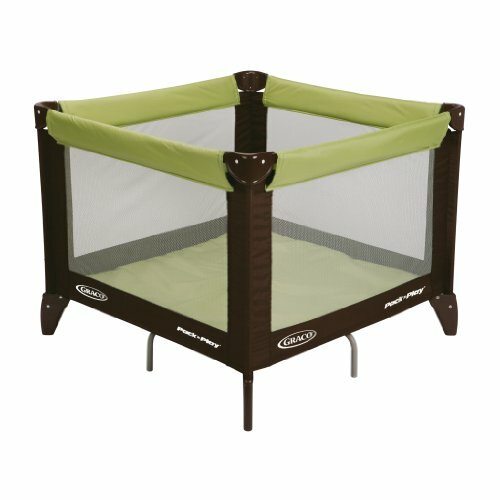 This is both one of the best portable play yards for quick trips and the best travel play yard for longer ones. You can also read our in-depth review of the Cosco Funsport. For more information on the Cosco Juvenile Funsport Play Yard click here. The option to use a play yard for babies outside will be essential for some parents. There are some great play yards available that are versatile enough to be used for both, and even be used for travel. Both of these are also cheap play yards for babies. Below you will find the best baby play yards that are also the best outdoor play yards. Possibly the best play yard available for use outdoors is the high quality North States Superyard. It is also one of the largest, with its eight large panels encompassing more than 34 square feet of play space. It’s panels are a good height, making it hard for kids to climb or tip over the pen. The great size means that more than kid can be accommodated easily. Two young children and an adult can easily fit with room to play together. This is great if you want to be able to join your children for some play time without having to be cramped or taking toys in and out. If you want a smaller pen you can remove two of the panels to make the play yard a hexagon. North States manufacture their play yards in the US using high quality BPA and lead free plastics. The overall quality is high, although some people have reported issues with the gate cracking and needing to get it replaced. Still, this is a great play yard for either indoor or outdoor secure play. See the latest prices and read more about the North States Superyard Colorplay 8 Panel Playard. The ProSource Baby Kids play pen is one of the best outdoor play yards for toddlers, offering 13sq ft of space, which I think is perfect. This large baby playpen really is designed for play, as it includes an activity panel that will allow your child to make the play pen their home. I thought this was awesome. Within the activity panel there is a picture of a house, a toy telephone, and some other small touches that will give your child their own fortress, which is the coolest thing when you are young! This activity play yard really is designed to be used as a home. There are also stickers included to really make it home. Do note, however, that some reviewers have said that these stickers can peel off over time (you don’t want them eaten!). 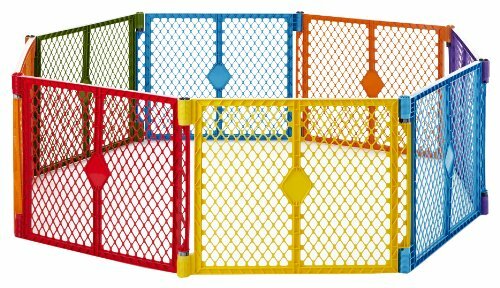 This baby play yard fence is incredibly solid, but still well equipped for travel, with each panel breaking off individually to be packed up and transported. Although the play yard is solid, it can slip on carpet. Luckily the playpen also includes suction cups on the bottom that are handy for ensuring that it doesn’t slide along the floor. This baby outdoor play yard is the best baby play yard for hard floors or tiles. Another thing I really loved about this play yard is that you can modify the size (13 sq is standard) by removing or inserting panels. The play yard also includes a hinged door that can be locked. The play yard is recommended for ages 3 and under, or basically until they realize how to unlock the door. This is the perfect outdoor play yards for toddlers at home, and will give your child their own home within their home. 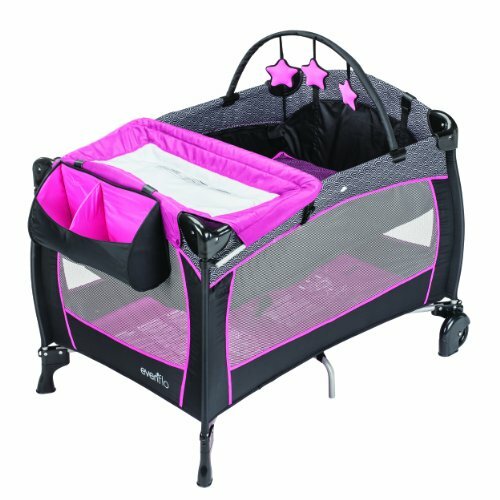 Click here for more reviews and information about the ProSource Baby Kids Playpen. The great thing about this particular play yard is that it will last you for a considerable time, because it can be adjusted depending on the size of your child, and therefore grows with them, right up until the age of 4 years. This is a different style of yard, as it is more like a traditional yard with gates and panels – you can take panels out or change the shape as you see fit, so your little one will never get bored of it! There is also an activity board on one of the panels, including a picture house, plastic play phone, and balls which spin, to keep them occupied as you go about your business. The door is lockable, so you have peace of mind, and you can easily take this yard with you wherever you go, as it packs down extremely small for storage or transportation. The colours are also very bright, which is great for grabbing attention, and you can throw in their favourite toys to go alongside the activity panel we mentioned earlier. The fact there are individual panels is what sets this pen apart from the others, literally working in a ‘pen’ style, rather than a set enclosed crib-style playard, helping children feel like they have more freedom. The Summer Infant Secure Surround play yard is another play yard that can be used both indoors or outdoors. This is one of the top rated baby play yards, and other baby play yard reviews have been very positive. If you need a large baby play yard then check out this one. This play yard is huge! It includes 18.5 square foot of space, and the play yard is 30 inches tall. At this height, it is taller than many other play yards, adding towards its safety. This big play yard is another play yard that is also size adjustable, where you can add to or remove from the 8 panel play yard to suit your space. Being made of plastic, the play yard is waterproof and durable to withstand the weather, so accidentally leaving it outside overnight is not a problem. The play yard also works well as an indoor play yard. The Summer Infant play yard has a walk through door, which swings in both directions for easy entry from either side, making it a baby gate play yard. I think that the best play yards for babies should be lightweight. I’m impressed that this large infant play yard can be transported easily. The outdoor playpen is portable – this play yard is in fact so lightweight and includes a carrying handle. As a travelling mom, this is important to me, and I could definitely see myself using this play yard for travel. For a plastic system, I am pleased to say it folds up well. The colors of the toddler playpen are neutral, bland and some would argue boring. 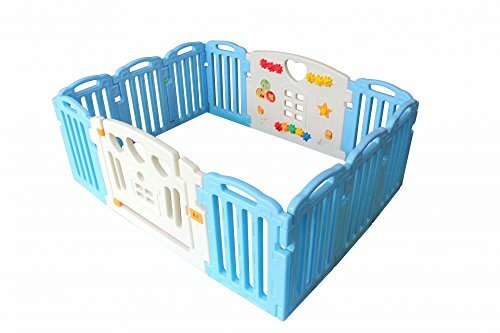 However, for being used outside I don’t think the most fashionable baby play pens design is required. The outdoor baby play yard is suitable for 6 months old to 24 months old, so there is not an awful lot of room to grow. My main complaint is that the holes are the perfect size for a baby foot or arm to go through – keep valuables away from arms reach! Regardless, I love it. For one of the more solid, versatile and lightweight baby playpens, this is one of the best. This is one of my favorite cheap baby play yards. Click here to read more about the Summer Infant Secure Surround 6-Panel PlaySafe Playard. The Evenflo Portable BabySuite 300 is another great play yard. 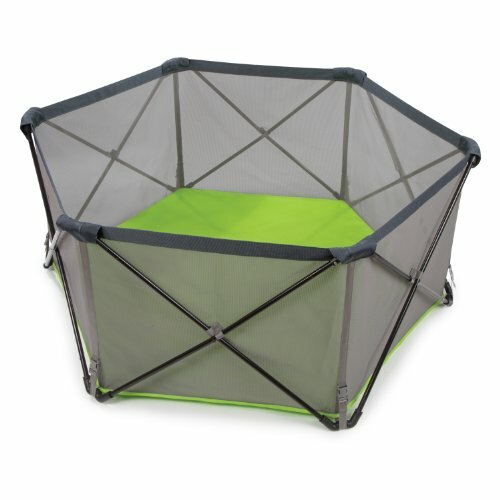 This play yard is made of lightweight polyester that is sturdy enough for support, but light enough for travel. The play yard is well built, fully supported on each of its 4 sides, and does not bend at all, which is rare on such a lightweight play yard and a common complaint with other travel play yards. The play yard includes a changer that will fold out of the way when not in use. Many play yards do not share this feature, but I think it is really quite handy and creates more open space to work with. The play yard includes a full sized basinet – how excellent is that! There is also a floor mat that provides some comfort and helps keep the play yard relatively clean. The floor mat also converts to a play mat, or play gym. I love when play yards live up to their name – they are for play after all and this play yard has 3 detachable toys. Set up is simple and it has definitely been designed with travelling parents in mind. The play yard playpen also includes a carry bag. The play yard has a generous weight limit, and I found the play yard to be incredibly sturdy. I would happily use it for travel. It can take some practice to take apart, but this was my only concern and not a big one at that. Even for all this convenience, it is still one of the cheap play yards. 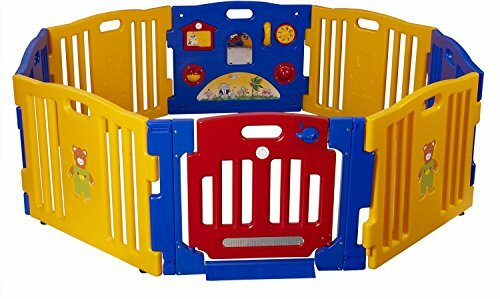 It is one of my favorite playpens for babies and a great travel play yard. Read more about the Evenflo Portable BabySuite 300 Play Yard. 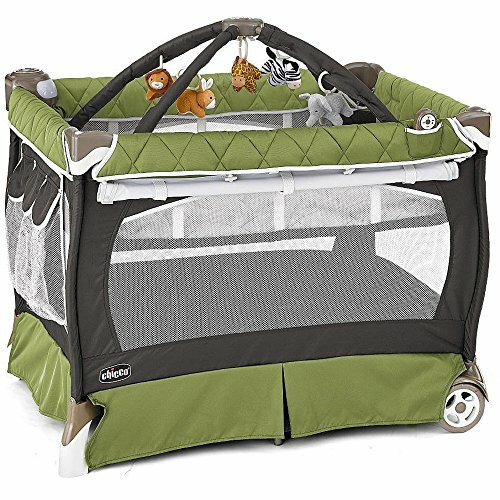 The Chicco Lullaby LX Playard is the another great infant playpen on the list. This is one my favorite play yards for baby. I love that this baby playpen is essentially a 4-in-one system. Included with the Chicco playpen is a bassinet and elevated changing station, best used for newborns. This means the play yard can be used as a portable play yard, an infant bassinet, a changing station and, by removing the play mat, it becomes a toy gym. The infant play yard includes a mattress pad that is removable, thick and really quite comfortable. It is also machine-washable, so cleaning it is not a problem. I also love that the play yard has a shield for sleep and mesh windows on all sides to keep watch. If you are looking for a play yard for a newborn to last through the years, then this play yard could be it. Once your baby outgrows the bassinet, you can leave it behind lightening the load and saving space whilst traveling. The playpen for babies has been constructed with a combination of steel, fabric and plastic, and the play-mat is a soft fabric that can be used on the bassinet. The elevated change station also has a soft, cushioned area and side storage for necessities. An added bonus of this baby play pen is the music maker that also has nature sounds. There is also a nightlight and an option for vibration. I found the playpen for baby easy to set up, but slightly more difficult to close and getting the bag on was a challenge! However, I’m confident this that the Chicco play yard could be the play yard for baby to last you for years to come. As it is a play yard with bassinet it would probably be my number one pick for top play yards for travel with newborns. 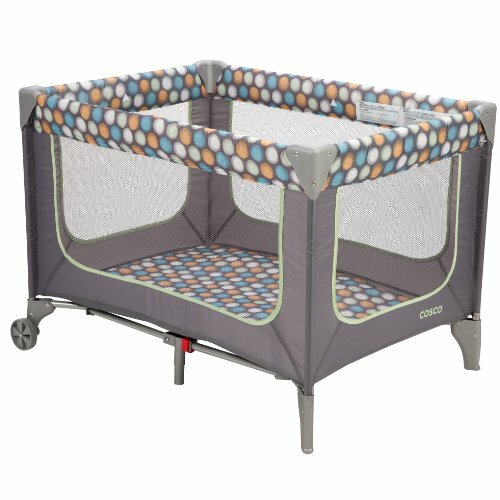 More Chicco Lullaby LX Playard reviews and information here. Another Graco product means more peace of mind, and reading testimonials on this big named brand will give you reassurance that you are making the right choice. This particular playard is a more traditional style, with high mesh sides for ventilation and visibility whilst your child is playing or sleeping. The flexible nature of the product means that you can use it either as a place for your children to play, nap, or perhaps as a place to sleep on travel trips or visits to grandma’s! The playard folds down easily with a one button mechanism, meaning no hassle when you are rushed on the go. There are also wheels on the playard, so you can move it from room to room with ease, and it collapses down into a small rectangle shape, with a free carry bag included when you buy the product too. This is a durable choice, which is long-lasting and hard-wearing, suitable for up to 12 months, or 35” tall, unable to climb out. There is plenty of room inside the playard, so you won’t need to worry about them being too enclosed, and it is also very easy to clean with a damp cloth or mild soap, in the event of an accident or spillage. Click here to read more and see the latest prices or read full review here. The Summer Infant Pop ‘n Play is the last babies play yard on my list, but there is nothing that should place it last on yours! This is a really fantastic cheap baby play yard that you can easily travel with. At such a low weight of around only 12 lbs, this has to be the best baby portable play yard that is just so easy to take with you. The kids playpen also has a huge 14 square feet of space for your kids to enjoy. This is one of the cheap play yards for babies, but also a toddler play yard as it can support kids from 6 to 24 months. The best baby play yards have at least some color, and I love the colorful design that this play yard comes in. If you are searching for a kids play yard for twins, I would probably recommend this one. It could easily fit another child and remains sturdy even though it is so lightweight. In regards to accessories, this play yard for toddlers does not really offer much. However, I am fine with that due to its incredible lightweight and ease of use. And besides, playpens for toddlers really don’t require that much other than their selves, their toys and possibly their companion. Conveniently, you can also use this toddler play yard outdoors which makes it even more convenient whilst travelling. I have seen a lot of toddler play yards, but I really do think this one is so useable. I love the though of bringing it with me on a beach holiday and allowing the play yard for kids to really get a use!This is another one of the best play yards for babies, and possibly the most convenient for travel. Click here to read more about the Summer Infant Pop ‘n Play Portable Playard. Some travel cribs also make great play yards. Read all our guide here.